Teachers rally at the state capitol in Oklahoma City, Oklahoma, on April 4th, 2018. 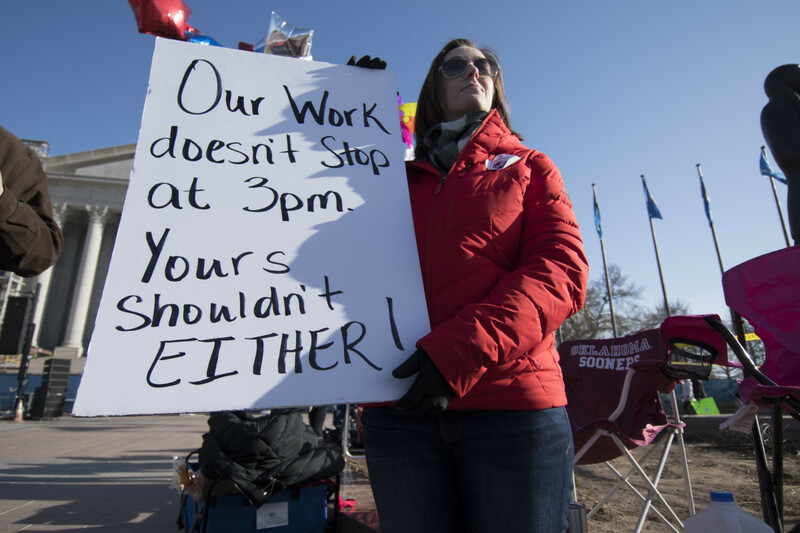 On Wednesday, public school teachers in Oklahoma entered the third day of a strike that&apos;s closed schools across the state. The strike comes on the heels of a successful teacher walkout in West Virginia that began in late February, lasted for two weeks, and culminated in Governor Jim Justice signing a bill that granted teachers, school support staff, and other state employees a 5 percent raise. Elsewhere, teachers in both Arizona and Kentucky have also staged protests and walkouts this week. 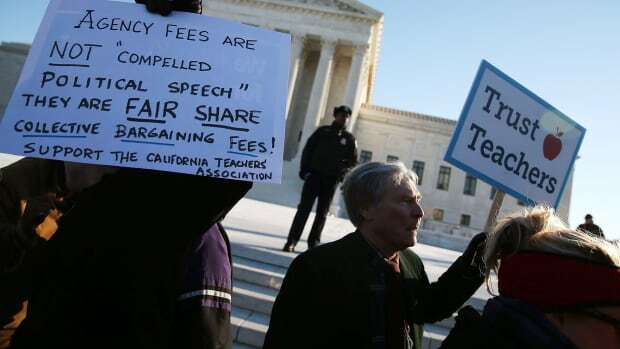 Most obviously, these teachers are protesting low pay and benefits in states where conservative lawmakers have made dramatic cuts to education funding in recent years. 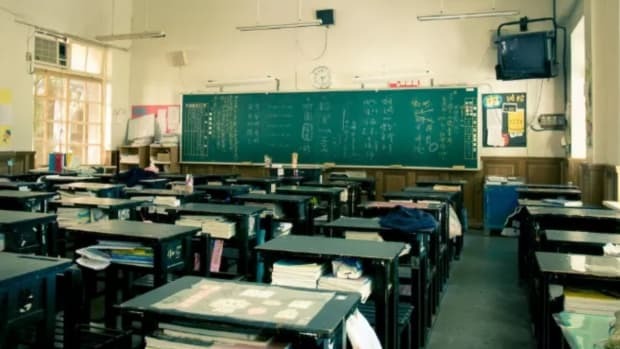 Oklahoma&apos;s teachers haven&apos;t had a raise in a decade, and educators in Oklahoma, West Virginia, Arizona, and Kentucky rank among the lowest-paid in the country. 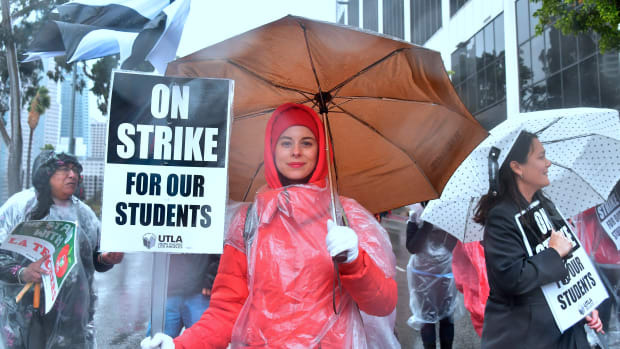 But the striking teachers have also made clear that their protests are about more than just their own pay and benefits. West Virginia&apos;s striking teachers, for example, held out until raises were granted to all state employees and school staff, not just public school teachers. 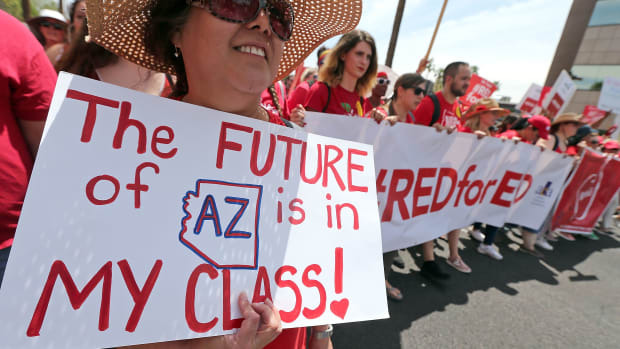 In addition to raises, Arizona&apos;s teachers are demanding a restoration of funding to pre-Recession 2008 levels and a guarantee from state lawmakers that they&apos;ll stop cutting taxes until the state&apos;s per-pupil spending levels reach the national average. In Oklahoma, where many schools have been forced to convert to a four-day school week due to funding cuts, the Republican governor and legislature actually passed a bill granting teachers a 16 percent (or approximately $6,000) raise before the walkout. The teachers, however, are holding out for larger raises, more school funding, and better pay for other school staff. In interview after interview, the teachers explain that they&apos;re striking for their students as well; some of Oklahoma&apos;s public school students have even joined in the protests, pointing out that it&apos;s hard to learn without textbooks and in classrooms with leaky ceilings. Shontée Branton, an Oklahoma public school teacher, told CNN that if she had to choose between a larger raise for herself and more public school funding for her students, she&apos;d choose the latter. "It would have to be the kids. I mean, that&apos;s non-negotiable," Branton said. "Yes, I need more money. I&apos;m tired of working multiple jobs. But in the grand scheme of things, if we educate these kids, then that&apos;s better for society." Teachers in West Virginia, Arizona, and Kentucky don&apos;t have collective bargaining rights by law, but these strikes borrow heavily from a collective bargaining strategy known as "Bargaining for the Common Good," first deployed by the Chicago Teachers Union in 2012. 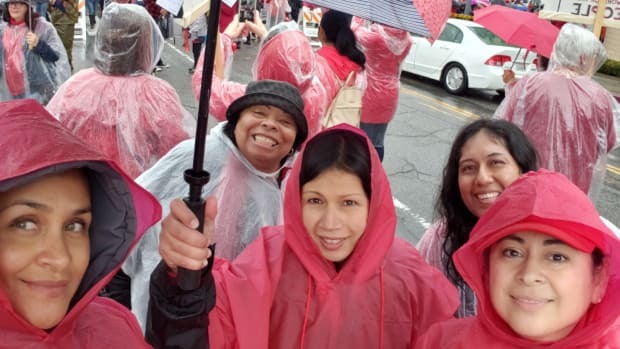 In that campaign, the CTU worked to develop alliances with parents and community organizations and integrate input from those groups into its bargaining strategies and demands. 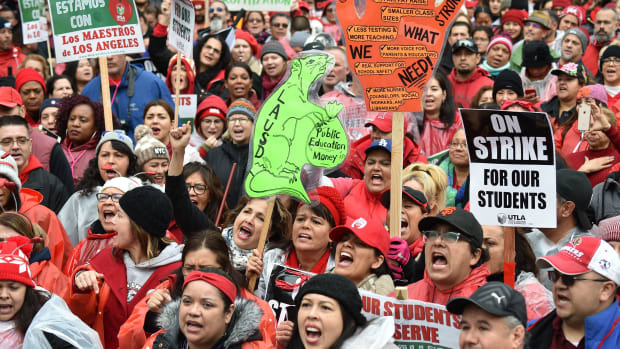 In recent contract negotiations, the CTU has fought for and won a number of victories for students—caps on class size, mandated student access to medical and mental-health services, and expanded after-school programs. Meanwhile, teachers&apos; unions in Los Angeles, Sacramento, Seattle, and St. Paul have followed suit, negotiating contracts that include everything from reforms of disciplinary policies that disproportionately harmed minority students, daily recess time for elementary school students, extra teachers for high-need schools, and expanded preschool programming. Advocates of this kind of strategy hope it represents a new opportunity for labor to regain both popular support and influence. Joseph McCartin is a professor at Georgetown University and the executive director of the Kalmanovitz Initiative for Labor and the Working Poor, which hosted a conference on the "Bargaining for the Common Good" strategy back in 2014. "What you&apos;re seeing is these unions acting as defenders of the public good," McCartin explained in an interview earlier this year. "More and more unions are taking this approach. I see it as a real indicator of creativity. Unions are responding to the realities of this moment, thinking about how to build their power in a different world." If the Supreme Court overturns Abood, will the middle class suffer?